The discovery has important implications for understanding the causes of facial defects which account for a third of all birth defects globally (3.2 million each year) and are the primary cause of infant mortality. 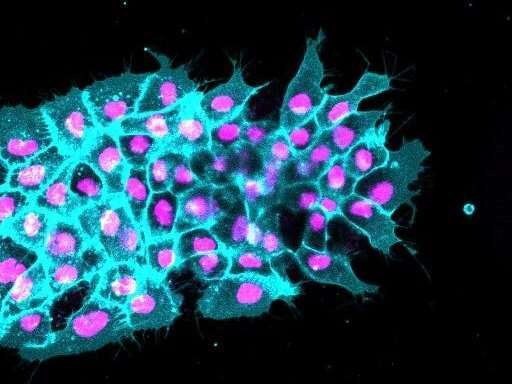 It is the first time that the mechanical properties of the environment surrounding embryonic cells has been shown to be crucial in cell movement and development, rather than genes or molecules. The researchers say it is likely that a similar mechanism is used by other cells involved in spreading cancer and wound healing. For the study, published today in Nature, researchers from UCL and the University of Cambridge investigated the importance of mechanical cues in the collective migration of neural crest cells in frog embryos. Frogs were chosen as a model organism as their neural crest (NC) cells behave in a similar way to those of humans and their movement is often used to study the spread of cancer. In addition, the embryo development of frogs can be studied without inflicting harm which isn't true for other animal models. "We've known that cell movement is essential for many processes in the body including the formation of embryos and cancer spread, but until now, most effort has been put into understanding the molecular cues that drive movement, rather than the role the mechanical environment plays," explained study lead author, Professor Roberto Mayor (UCL Cell & Developmental Biology). "We were surprised to see how important tissue hardness is for movement – it's the difference between walking on a hard pavement relative to soft sand. The cells sense the increasing hardness of their environment before moving to form the features of the face and skull. Knowing this will hopefully inform the development of preventative treatments for facial defects." The team tested the hardness of the embryonic tissue at various stages of development using a probe that touches the surface and measures its deformation under a known pressure. They found that during development, the tissue holding the NC cells stiffens and becomes denser with cells which triggers the cells' orchestrated movement. They modified the stiffness of the embryo tissues using actin and myosin – the same molecules used for muscle contraction – and found the hardness at which NC cells migrate. This was replicated using synthetic surfaces of the same stiffness in the laboratory. "We've found a new link between two previously unconnected processes – the thickening and hardening of tissues and the movement of cells. This is a really exciting discovery as it shows the importance of tissue mechanics and molecules in coordinating embryo development. We hope it inspires others working in oncology and tissue engineering to explore the role of tissue mechanics in other important fields," concluded study first author Dr. Elias H Barriga (UCL Cell & Developmental Biology and the UCL London Centre for Nanotechnology).